THE STUDIO 1999 to 2001--or not so Current News; What I've Been Working On, Etc. CARD ART--L5R: WotC to sell L5R--What a roller-coaster ride this game is! From the gradually building high-- peaking at this year's GenCon, to the release of Spirit Wars and the anticipation of Gold... To a drop into a big scary, dark tunnel with this news. Who knows what's next? We'll all probably survive, but this is a blow and no mistake. I have IMMENSELY enjoyed working and (if only slightly) interacting with the WotC L5R team. Of course I'll particularly miss working with Paul Allen Timm, who was a terrific Art Director for L5R. Even though I don't have time to play the game (and can't play it worth beans anyway), I'm a big fan of the game and will miss everyone involved in it who has been laid off or shifted on to other projects. Good luck with new projects, everyone. I know you'll be as successful at them. HAPPY HOLIDAYS AND BEST WISHES FOR 2001 AND THE NEW MILLENNIUM TO EVERYONE!. CARD ART--L5R: Spirit Wars expansion was released. I found out that aside from the 6 images I painted specifically for the set, 2 images that were used for the Buttonmen promotion at the Y2C convention were used for cards and also one piece I did for the "Character Bank", so I had a total of 9 images, which is a lot for me. CARD ART--L5R: Alpha--5 cards for the yet-to-be-named and currently fate-undetermined expansion for Gold. Due 7 November. CARD ART--7thSea: Reaper's Fee--I finally found time to do more than a couple of cards--4 to be exact--for this game. These were a lot of fun. Due 3 November. CARD ART--Wheel of Time: Children of the Dragon--I didn't have time to do any cards for the last expansion, but did 4 for this one--all aiel. Due September. You can see a lot of the art for this expansion if you go to this site. CONVENTION APPEARANCE--CHICON, the World Science Fiction Convention in Chicago--I had a great time at this convention. I participated in some panels: "All is not Book Covers" (with Margaret Organ-Kean and others), "Computer Game Design" (with Blizzard's Mike Dashow, &al. ), "A Print is a Print", and "From Fan to Pro". Had art in the show. Had a wonderful time with people hanging in the ASFA Suite (and elsewhere): Ed Cox & Rebecca, the insane Diesel, Lubov, Theresa Patterson, Rob and Sue Alexander, Rachel Holmen, and many others. Saw the Tyrannosaurus Sue at the Field Museum. Had a wonderful day touring the Art Institute's Museum with Theresa Brandon and Randy Asplund. And my thanks to Todd Lockwood and Jon Schindehette for hosting some 'business' drinks and dinner. Labor Day Weekend. CARD ART--L5R: Gold--6 cards for the "second batch" of assignments. Due 26 June. MUSICAL THEATRE--Saw "The Scarlet Pimpernel" musical at the Ahmanson Theater. The plot was changed from the book and some parts were made a bit less dramatic, I though, because of it, although melodrama was increased... The big chorus numbers were fun, especially the one with Percy and his Men. June 16. CARD ART--7thSea: Fate's Debt--2 cards, due July 10. I wish I could take more cards, but I'm being pretty worn out by all the L5R: Gold work. CARD ART--L5R: Gold--4 cards (for 3rd. batch), due July 17. CONVENTION--SAN DIEGO COMIC CON-- I was on a panel with a huge number of Magic artists and the art director on Saturday (Moderated by Ken Meyer Jr.; Terese Neilsen, Ed Beard Jr., Ron Spears, Daren Bader, Donato Giancola, rk post, etc.). The discussion was how to get into the business. Everyone related their experiences. I was surprised that most went to art school and got work in fairly traditional ways (agents, mailings, mentors, conventions). Ed Beard Jr. had the most colorful job experiences. Recommended was: being well-rounded, not just in art, and working very hard at the craft. I spent Sunday trying to get through the HUGE exhibit hall/dealers room. I did not make it all the way through in the 5 or 6 hours I had! I bought a few fun toys and some nice books, though. ComicCon is always a great place to see art, meet people, buy stuff... July 20-23. CONVENTION--GENCON !!!! !-- What can I say about GenCon??? It is always a great event! I had a corner booth that I was supposed to share with artist Liz Danforth, but Liz couldn't make it at the last minute, so I had plenty of room to spread out in. My prints and original art favored L5R, since it is so popular at GenCon. I had several new prints this year: "Utter Defeat" "Mirumoto Uso" "Uso & Kaiten from the Y2C buttonmen" "Imperial Ambassador" "Shiryo no Hoturi". Of course, I was asked about prints of the Soul of Empire art--but that expansion had just been released and the art had not been returned. My sales were not spectacular--pretty much the same as the last few years. I had a wonderful time signing cards and chatting briefly with the L5R players. They have GOT to be the best group of gamers around--polite, interesting, loyal, enthusiastic. That I continue to sign the few Magic cards I've done also surprises me. That group is dedicated, also. I enjoyed getting together with old friends in the evenings: Ruth, Todd, Vicky, Allen and their terrific crew. Also seeing Tina (NeNe), who had her endcap across from my booth, and who helped me out when I needed to take credit cards for a few purchases. I enjoyed meeting other artists, seeing people from the Illustrationnet List. And those from RPGFreelance, too. And it was great to see my wonderful art directors: Paul Allen Timm, Jim Pinto and Ed Beard Jr., and meeting Mike from Precedence. It was a wonderful time, all around, even though it's so expensive and I have to knock myself out getting ready for it every year! August 9-13. CARD ART--7thSea SCARLET SEAS--2 cards, due March 31. VACATION--Finally got a weekend of skiing in, at Mammoth Mountain, CA. First time in over a year. March 23-26. CLASS--Signed up for another 4 week novel writing workshop led by Emma Bull and Will Shetterly. April 18. CONVENTION--Briefly dropped into CONFURENCE in Irvine, CA, April 8&9 to visit with friends. CARD ART--L5R SPIRIT WARS--six cards due April 10. CARD ART--SHADOWFIST--the TCG is being revived!--2 cards due April 15. CONVENTION--NORWESCON SFcon in Seattle/Tacoma, April 20-23, did art show and panels. CONVENTION--ELECTRONIC ENTERTAINMENT EXPO in LA--just went to look about and size up the competition and see 3DO's booth. At New World Computing, we worked hard to get a working demo of LEGENDS of MIGHT and MAGIC done for this show. MUSEUM VISIT--Went to see "Pharoahs of the Sun" exhibit on Ahkenahten's reign and art from Amarna, Ancient Egypt, May 11 at LA County Museum of Art. Wonderful to see all the carvings and objects--especially the two colossal statues (busts mostly) of Ahkenaten. CARD ART--L5R: Gold Edition--6 cards assigned, due June 26. CONCERTS--The Cure--one of my favorite bands--I have tickets for 3 of their S.CA concerts, yahoo! May 28, 30 and 31. GENCON update--I got my booth assignment. #1142, which is on the right side of the room, middle-back, about where I was last year. I will be sharing a booth with Liz Danforth again. WEBSITE--Tripod has stopped my ability to pay to keep ads OFF my pages. I will be looking for a good host for my pages so I won't have pesky ad banners or pop-ups. And will probably do a major revision. But this will probably have to wait until after GenCon and after "Legends of Might and Magic" is finished--in September. MILLENNIAL CELEBRATIONS--Watched them on TV and was happy to see that there were no Y2K disasters! CARD ART--L5R "Character Bank" maybe for Gold Ed., but I'm not sure--three cards due in Feb.
CARD ART--Four cards for DOOMTOWN "Ashes to Ashes", which has moved from Wizards of the Coast back to AEG. CARD ART-- Assigned three cards for 7TH SEA expansion, SHIFTING TIDES, due Nov.99. 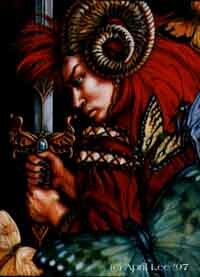 COMPUTER ART--The art is finished for MIGHT AND MAGIC 8: Day of the Destroyer. I still need to update my CD-ROM art pages. CARD ART-- L5R expansion SOUL OF EMPIRE, 7 cards due Jan. 00. This looks to be an eventful expansion! APPEARANCE--GENCON!!! I had a great time, as usual. I premiered several new photoprints: Doji Shizue (Exp2), Shiba Tsukune, Kakita Yoshi (exp2), Sentinel (or rekai2000), plus had Lotus Petal Postcards. I'll try and list these on my Prints page, but it may take a while. CARD ART-- Assigned two cards for 7TH SEA-first expansion, due mid-August. WEBSITE-- I got a domain name: www.aprillee.com ...I'm also overhauling things a bit, slowly... Getting things to look more uniform and moving pages to Tripod, where I've paid to remove the pop-up ad banners--HOORAY for that! CARD ART-- Not exactly... button art for L5R's upcoming Y2C convention. CARD ART-- Another LEGEND OF THE FIVE RINGS (Fire & Shadow) assignment is on the board. 6 cards, due in August. APPEARANCE-- I just returned from a marvelous weekend appearing as the Artist Guest of Honor at CONCUSSION, a Science Fiction convention in Omaha, NE-- June 4-6. CONNIE WILLIS, award-winning SF author, was Guest of Honor. It was a delight meeting her. She was happy to discuss "The Phantom Menace" and to defend JarJar, slightly less happy to mention the upcoming novel, which was under a looming deadline. There was a trip to the Jocelyn Art Museum, which had some lovely Bourguereau's and an Alma-Tadema in its collection. I had time to have some great guys demo L5R for me, and I played in a fun L5R RPG demo. I did a painting for the program cover --which I will probably be making a print series from soon. They also made t-shirts with my art on the back. Try contacting the ConCussion people if you're interested! CARD ART-- Current assignment is for a new card game from Precedence based on Robert Jordan's WHEEL OF TIME fantasy series. Art due in July. COMPUTER ART--MIGHT AND MAGIC VII is now out on the shelves. To see some of the artwork I did for this game, go to my CD-ROM GAME GALLERY PAGE 4. CARD ART--Bad news! The art directors for L5R and DOOMTOWN, KC Lancaster and Bryon Wackwitz were let go. I thought they were doing a terrific job--both games were doing well and players seemed very happy with the art direction. Some internal shake-up at Wizards--I guess! But not to worry too much--the new guy (Paul Allen Timm) seems like he really cares about the look of the game & is working closely with Ree Soesbee. CARD ART--SEVEN SEAS is a new game world being developed by AEG/Five Rings/ Wizards of the Coast. I did my first assignment for them--only 4 cards, alas, for the CCG. CARD ART--L5R, Ambition's Debt expansion art. I did 3 cards for this. TRIP--To NYC to see my old college room-mate. We drove up to our alma mater, MOUNT HOLYOKE COLLEGE for the weekend for the reunions. The campus was as beautiful as ever--tucked away against the low forested hills and little lakes of Western Massachusetts. The dorm buildings are mostly red-stone, neo-gothic structures with high ceilings and communal bathrooms, with sitting rooms, piano, tv rooms and dining rooms. I have fond memories of taking English-style riding lessons in the ring (before the big new equestrian complex was built! ), and walking to classes through snowy winters while hearing the chapel bells chime. MOVIE--I so seldom get to see one, it's a big deal--but a bigger deal is to see "THE PHANTOM MENACE"--part 1--of the prequels to the Star Wars trilogy. NewWorld Computing, in the spirit of not even TRYING to buck a trend, very kindly bought us tickets for ourselves and guests for an afternoon showing on Opening Day, May 20. Yahoo! --Of course it's not "Citizen Kane"--but who cares??? It's a Star Wars movie--and enjoyable by definition! CONVENTION-- CONFURENCE was held April 1-4 in San Diego this year. I was in the middle of assignments, so I didn't have time to do my annual "Bast" painting. It was still a joy to hang about the convention and visit with all the artists and friends. MUSEUM--The VAN GOGH art exhibit was at the L.A.County Art Museum in the spring. I went to see it March 7. It was a Sunday, and so sold out and very crowded. The lines moved quickly and it was possible to travel through, guided by the recorded tour, without too much trouble--although it was difficult to stop and really 'commune' with any painting! It is always a treat to see an original Van Gogh--his paint strokes are so wonderfully textured and the colors just are never captured as well in prints. CONVENTION--CONDOR was February 12-14 in San Diego. I had my usual few panels to try and say something at, plus --for the first time--a slide-show of my art. Old photo of me at the World SF Con (Magicon) in Orlando, FL in '92--when people wore hats with silly red flowers on them and held sparkly-blue fish puppets on their shoulders...?!? Two photos of many which I took on my brief trip to London in March (to visit friends and attend the Oxford University RPG Society 20th. Anniversary Banquet) in 1997. I will probably be producing a print edition of some of these when I can get around to it. I have art in a black and white Portfolio called "MYTHS AND LEGENDS", along with other artists (TERRIE SMITH, MICHELE LIGHT, HEATHER BRUTON, DIANA STEIN, FRANK GEMBECK & JOYCE NORTON), on sale. It's $15.00 Contact me for more information. Here's one of two pieces I've done for the portfolio. I did two images from Latin American(Pre-Columbian) Mythology. The portfolio will be black and white. Please contact me if you'd like one.